Managed by Auberge Hotels, ninety Designer Suites strive to bring urbane Miami visitors to new heights. Tasteful, striking interior design brings together elegant furnishings with notable works of art in these fully equipped suites. Guests can work with staff to customize the specifics of their stays however desired, elevating the experience to a new level of luxury. The optimistic blues of the afternoon, the soothing pinks and purples of sunset, or the mysterious darks of the night – no matter the time, the sky is the limit when it comes to the observatory at Auberge Miami. Soaring to a dramatic 650 feet in the air, the private observatory is the highest in the city of Miami and features stunning, unparalleled panoramic views. With an outpost like this, it would be difficult to forget what makes Miami living so distinctive. The generous sundeck also offers another pool, perfect for hitting the water and enjoying the tropical Miami weather. Afterward, it might be time to curl up with a good book, catch a hard-earned afternoon nap, or kick back for some chit-chat, and the gracious accommodations of the sundeck’s private cabanas present the perfect backdrop for a comfy retreat. There’s no end to the havens that await at Auberge Miami. The 290 residences at Auberge Miami are based on open-concept, flow-through floor plans with one, two, or three bedrooms, with interiors designed by Piero Lissoni. Each unit revels in its breathtaking Miami setting with floor-to-ceiling windows that provide views of the Biscayne Bay and an oversized private terrace with transparent glass railings. 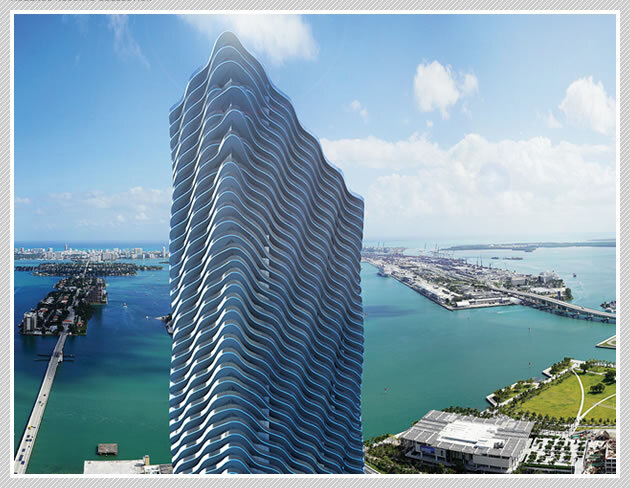 Auberge Miami offers a limited number of Sky Penthouses and four Duplex Sky Penthouses. Each residence’s interior is the height of contemporary luxury, from spacious walk-in closets to gourmet kitchens with custom Italian cabinetry, a selection of finishes, countertops, and backsplashes, and integrated paneling to conceal the refrigerator/freezer and dishwasher. Each kitchen also includes a 36” Monogram refrigerator/freezer, a stateof-the-art Wolf appliance package, and design that opens to the living and dining rooms. The baths spare no comfort, either, with imported stone vanity tops with double under-mount lavatories, illuminated mirrors, and premium Italian cabinetry. Master baths boast spacious soaking tubs, frameless, glassenclosed optional designer privacy screens and imported marble flooring in wet areas. Most residences also contain powder rooms. Each residence and penthouse enjoys private, high-speed elevator access.